The three Pyrenean middle mountains on the plate make this a meaty starter that will leave us furiously waving at the ASO garçons for more. After the climbs of the Portel and Port de Lers, the never-before-used Mur de Péguère, forty kilometres from Foix, is an intriguing proposition. The Tour bunch was supposed to go up it in 1973, but legend has it that the climb was removed when riders protested it was too steep, the big jessies. They weren’t wrong though. Its narrow, twisting road hits double-figure, clutch-burning gradients for the final three kilometres. If those the roadside signposts could talk, they’d be gasping “sections of 16 and 18 per cent!” in Brian Blessed-on-Everest tones. Its impact will be tempered by forty-odd downhill or flat kilometres into Foix. A big breakaway of strong riders who are suitably distant from the yellow jersey get away before the first climb and go on to contest stage victory. Someone from the escape will go for broke on the Mur de Péguère, which ought to halve the breakaway, though the flat run-in favours a return for escapees who can limit their losses. Behind, it won’t make much difference. When will ASO learn that putting the finish an hour down the road from a demanding final climb wrecks its impact? History and logic suggests the favourites will tap over it, given the distance to the finish and proximity of the pivotal Pyrenean days. But we’re still hoping for a testing dig from someone. Please. Verdant forests and quaint towns in the Pyrenean mid-mountains. Cassoulet! A belly-busting hors-catégorie hotpot of beans, duck and other indeterminate meats. It’s our favourite French food and, wouldn’t you know it, Foix is home to our favourite cassoulet restaurant. The Mur de Péguère: bye-bye breakaway cohesion. “Jens Voigt and I had carte blanche to go for the win. 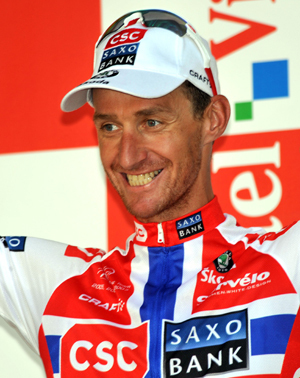 Frank Schleck was second, one second down on Cadel Evans. Imagine if he had the yellow jersey: I’d never have won a Tour stage, I’d have been chasing the breakaway instead. “It was a fast start on narrow roads. Jens – that animal – was covering everything. I got to the front after 35 kilometres, tried three times and got away. I immediately saw that this was the right group: there were strong, Classic guys like Pozzato, Ballan and Wegmann. “Once it settled down, I was thinking about saving energy for the finale, doing as little as I could. The attacking started with fifteen kilometres to go. I said to myself ‘I want to follow or attack, I want to get to the finish line with no energy left. I don’t want to sit back and see the win go up the road’. “When Martin Elmiger went, I got his wheel, and Ballan and Moerenhout joined us. I took the tight last corner first. Maybe that wasn’t so smart, but I’d seen it in the roadbook. “I won the sprint by two centimetres from Elmiger: closer than I’d have liked but it’s a moment I’ll remember for the rest of my life. You don’t get many opportunities in the Tour: in five Tours, I was in three breakaways. “I think I was crying a bit afterwards. Seeing how happy my teammates, staff, fellow competitors and Norwegian journalists were was the most emotional part of it. – Foix has hosted one stage finish, and two stage starts in the Tour. In 2008, Kurt-Asle Arvesen won here. In 2001 Lance Armstrong won a stage starting here and finishing at Pla d’Adet, and in 2007, Alexandre Vinokourov won a stage starting here and finishing at Loudenvielle. Then he tested positive. 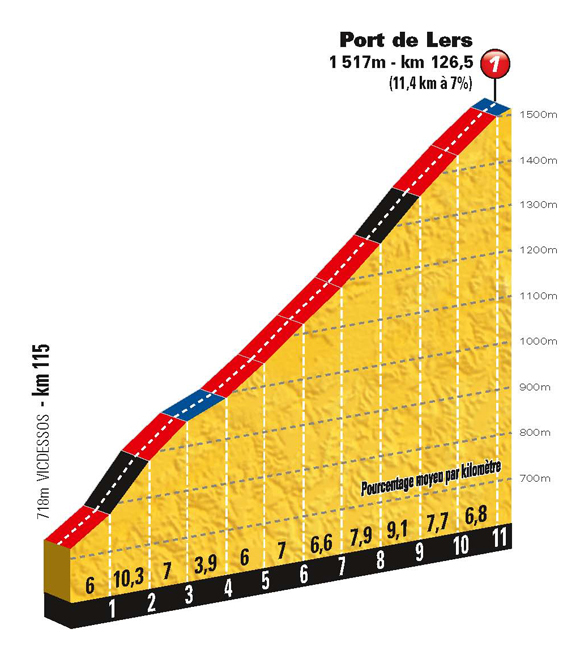 – The Port de Lers makes its third appearance in the Tour, after 1995, 2004 and 2011. – The top of the Mur de Perguère as the riders turn off the D618 is probably the steepest pitch of climbing in the entire Tour. For three kilometres, the average doesn’t drop below 10 per cent. 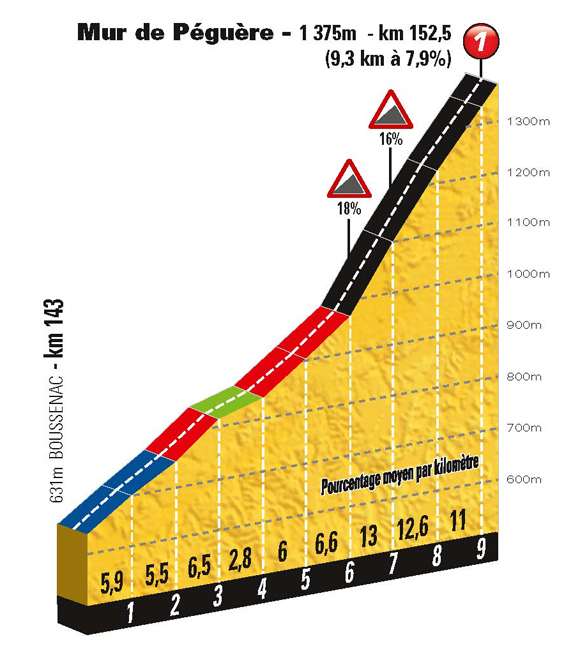 The only climb that comes close is the Col de la Croix on stage eight, which is 9.2 per cent for 3.7 kilometres, and the Planche des Belles Filles on stage seven, which is six kilometres at 8.5 per cent.